BLU Products is mostly known for its very cheap Android smartphones, but it looks like the US-headquartered company expanded its portfolio to include smartwatches as well. The new BLU X Link is definitely not among the best smartwatches you could get these days, but it's an interesting alternative for those who don't want to spend more than $100 on a wearable device. Running a very basic OS that offers features like heart rate, notification sync, and step tracking, the BLU X Link has a SIM card that allows users to take and make phone calls, as well as SMS. The bad news is the smartwatch only has 2G connectivity support (850/900/1800/1900Mhz). On the flip side, BLU says the X Link sports a 1.1-inch IPS display and that the smartwatch features IP54 rating (water and dust resistance), as well as Bluetooth connectivity. 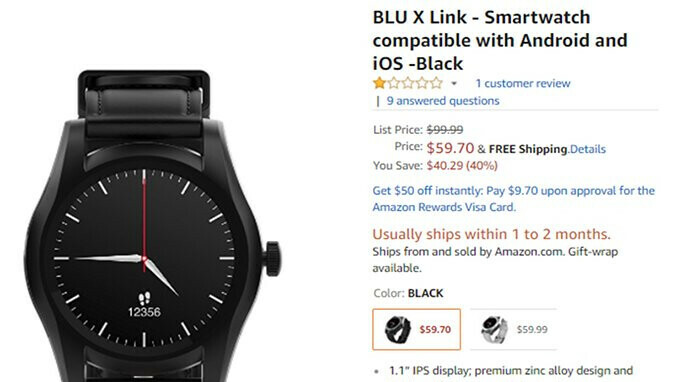 Another advantage would be the fact that it costs only $60, although Amazon has it on sale for 40% off, so the BLU X Link actually costs $100. The smartwatch is up for pre-order at the US retailer and it's supposed to ship on June 6 or later. Absolutely terrible! Only 2g support??? Looks pretty nice but I wouldn't pull the trigger on something without any idea what the OS can do. I think the screenshot on this article with the 1 star rating pretty much sums up what we can expect from this. So, at least in the US and Canada, this is a T-Mobile/ROGERS only smartwatch. I get the cheapness of it due to the price point, but with 2G only, why even bother with the cellular connectivity?